The exhibition included a miniature gold box in the form of a Doge’s hat in yellow enamelled gold simulating satin, and another wittily representing a coal scuttle. They were shown alongside numerous studies of animals including striding elephants, chimpanzees and pouter pigeons carved from coloured hardstones. 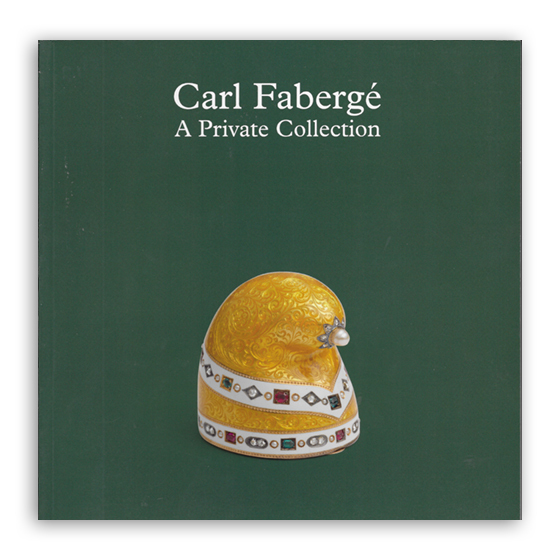 A vessel in the form of an African drum, a scent flacon in the form of a miniature tube of paint and a compact in the form of an enamelled egg display not only Carl Fabergé’s own creativity but the discrimination of the collector, who has spent over thirty-five years assembling this remarkable group of objects. Amongst the most delicate pieces are rare flower studies as well as examples of jewellery, the most iconic being a platinum gem-set latticework brooch that echoes the design of the Mosaic Egg in the Royal Collection.